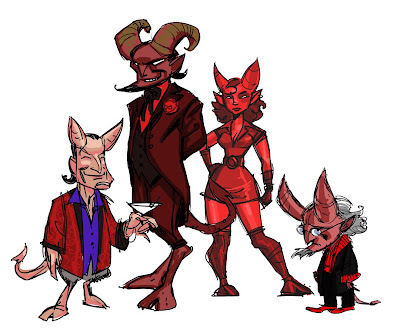 Here are a few super quick character sketches from a couple of years ago when Telltale Games was thinking about Satan designs for the Sam & Max series. My nervous habit is drawing the Phantom of the Opera. I have hundreds of drawings of him from times when I'm in meetings or just sitting idle with a pad. 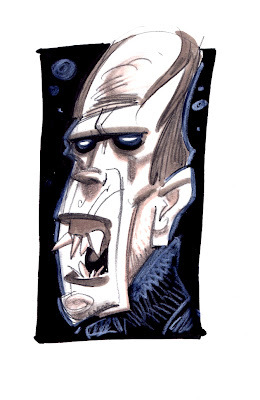 Though I'm also fond of drawing Frankensteins, apes, devils and clowns the Phantoms currently dominate by far. I'm assembling a hundred of my favorites to put in a miniature book. When doing an illustration I tend to do three concepts for the client. I usually have an idea right away, a sort of gut reaction to the assignment, and more often than not that is the one I want to do. When I create the subsequent two roughs I have to make sure they are ideas that I would be just as satisfied to take to finish since the client won't always pick the one you love the most. 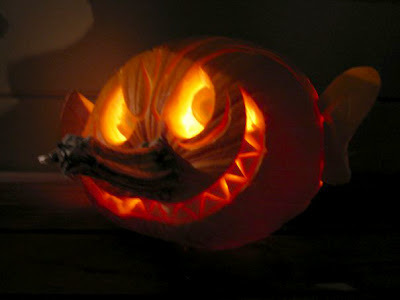 In this case Telltale was interested in which one I wanted to do the most. Based on the pitch of the story and some early looks at the artwork they were creating for the game I was leaning toward a kind of eerie feel in the first sketch. Since I had already painted LeChuck for the Monkey Island 2 cover I was more interested in featuring Guybrush for this one. And since I was never quite happy with my Elaine in the first Monkey Island cover I was happy to include her in each of the concepts. These were done quickly on a Cintiq tablet to get an impression of the composition and potential color palette. My final painting had less of a green cast to it. As I work on a painting sometimes I go off on a different path than I had planned. I still like the green of the sketch but I also like the variety of background colors that grew out of the process of making the painting.